In my new column at Salon, I continue to explore my love and enthusiasm for the magnificent work of the late and great Jim Harrison. Harrison’s new book, a posthumous collection of essays on food, wine, pleasure, and art, acts as a manifesto for Epicurean hedonism. It is a joy to read, but also subversive in a largely Puritanical culture. I have previously written about Harrison for Salon, the Daily Beast, and this website. Read my past essays. In my newest column for Salon, I use the recent footage of Mitt Romney devouring his own soul for the amusement of Donald Trump as a predicate to examine America’s destructive culture of hustling. Historian Morris Berman has argued that hustling is all that occupies the center of the United States, and because hustling is philosophically and ethically empty, it has led to irreversible decline throughout the country. The election of Donald Trump is the political manifestation of the hustling culture. Read the column at Salon. In my new essay for Salon, I revisit the master’s work, paying particular attention to the 1871 essay, “Democratic Vistas.” Whitman’s exploration of the struggle of democracy, the beauty and necessity of diversity, equality for women, the gullibility of the populace, and the essentiality of creating a culture of democracy, with the fine arts at the center, applies to America in 2016 with stunning prescience. Read the rest at Salon. As the New Year dawns, let’s admit that the American psyche is a dilapidated maze of funhouse mirrors that leads nowhere. It should not shock even the most credulous patriot that many people who spend their internal lives within this maze of narcissism and dysfunction have major problems. One in five Americans suffers from some kind of mental illness, according to the Substance Abuse and Mental Health Services Administration. The New York Times recently reported that suicide rates are rising so rapidly and steadily that more Americans now die of suicide than in car accidents. In a turn that vindicates Aldous Huxley, one in ten Americans ingests their daily Soma supplement in the form of antidepressants. Many Americans are like Soren Kierkegaard’s allegorical corpse who did not realize he was alive until the morning he woke up dead—aimlessly wandering around in a drug addled haze, indulging smart phone addiction, disconnected from reality and community, while wondering why they feel unhappy and unfulfilled. To worsen their condition of alienation and dejection, many Americans, in an attempt to feel better, read books that manipulatively sell mindless optimism and pathological hope. The cult of positive thinking turns out one hit after another, both secular—The Secret—and Christian—Joel Osteen’s prosperity gospel. The delusion that changing a life is as simple as believing it will change, and the poison that pretends God wants people who pray early and often to win the lottery, only raise expectations to unrealistic heights, and set desperate people up for a crushing fall with a crash landing. Since Americans seem to love making New Years resolutions, now might be a sensible time for many to resolve to gain maturity and perspective in 2014. Such a process of self-education can and should begin with the close reading of books containing wisdom that will alleviate their anxiety, provide edifying purpose, and begin to transform their minds from circuses to cathedrals. Check out my ten book recommendations, including Albert Camus, Ernest Hemingway, Gore Vidal, American history books, sexual advice, and a “loafer’s manifesto”, at the Daily Beast. Morris Berman is a starry eyed realist whose message is not for the faint of intellect or hardhearted. He is an important and wise historian whose trilogy of books on the decline of America (The Twilight of American Culture, Dark Ages America, and Why America Failed) takes the unpopular, but serious and persuasive view that the American economy and empire are in freefall, with no hope for recovery. I make the argument in that essay, as I do in my introduction of my new interview with Berman – “How America’s Culture of Hustling is Dark and Empty”, that his work is of profound, and also, because of his tough, challenging, and realistic message, singular importance. I recently had the opportunity to meet Morris and share a few drinks with him in a quiet, Grand Rapids, Michigan bar. It delighted me to discover that his sense of humor, easygoing camaraderie, and generous disposition, makes him more likable, and his work, more appealing. 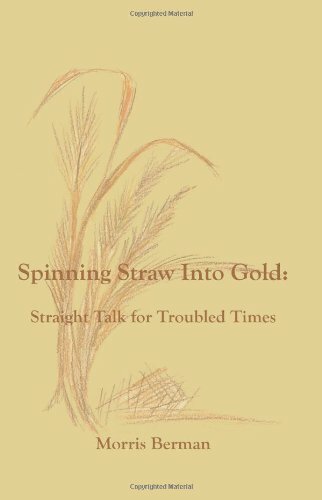 In Berman’s new book – Spinning Straw Into Gold – he examines his own life, and ruminates on what finally provided his life with meaning, purpose, and peace. He leads by example, and through his personal and profound rumination on his own life, he gives readers challenge and inspiration to find the meaning of their own lives. It would be wrong to call Spinning Straw Into Gold “self-help”, except only to say that it reinvents the self-help genre. It liberates it from the hollow clichés and boring platitudes of the Joel Osteen or Rhonda Byrne bestseller, and returns it to the enlivening, enlightening, and enchanting world of philosophy. I interview Berman on the new book for The Atlantic. If you take a moment to read the comments after the interview, you’ll treat yourself to a great display of existential meltdown. In the interview, Berman states that most Americans are “afraid, angry, and desperate.” American commenters, in an attempt to refute Berman’s analysis, then proceed to unleash a torrent of invective, vitriol, and mean spirited attack on the author, about whom they know they little. One particular strain of comments, I feel, deserves a moment under the spotlight, if only to embarrass and humiliate those responsible for it. First, Berman is not rich, but he is successful. Success demands respect, not condemnation. Second, and more important, taking this argument to its logical endpoint would require the dismissal of all philosophy. Philosophers always come from a certain place of “privilege”, because without it, they would not have the time, energy or ability to lecture, write, and contemplate the world. Identity politics and insulting people for their success are two contemporary distractions from the larger questions of American identity, meaning in an increasingly meaningless culture, and authenticity in a artificial society. These are the questions Berman tackles in his new book, and the questions we consider in our conversation.